Have a 1911 you're itching to shoot in competition but Bullseye is too staid for you and IDPA and USPSA seem a bit too high speed/low drag? Have a 1911 you're itching to shoot in competition but Bullseye is too staid for you and IDPA and USPSA seem a bit too high speed/low drag? Don't despair because there are two relatively new games where your pistol will be more than welcome. The Single Action Shooting Society isn't just for Single Action Army revolvers anymore. SASS now conducts Wild Bunch cowboy action matches that reflect guns in use in the West around the turn of the 20th century. 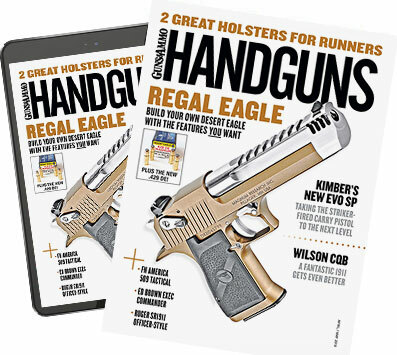 All you need is a 1911 (.40 caliber or larger) and four to six magazines for the handgun portion. For long guns you'll need a lever-action rifle and an 1897 pump shotgun. Visit www.sassnet.com for more information. If cowboy duds aren't your style and you want to dress a little more upscale, check out Zoot Shoot competition. The American Zoot Shooters Association brings back the Roaring Twenties via timed stages called "capers." Come as your favorite copper, gangster or flapper, and bring your 1911, which is the most common handgun used in this game, although other types in use during the period that are .32 caliber or larger will be considered. The long gun embraced by this sport is the Tommy gun, and while full-auto Thompsons are rare indeed, Kahr Arms/Auto Ordnance makes a semiauto that's just the ticket. Visit www.ZootShooters.com for more information.